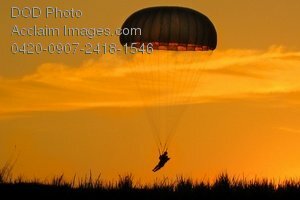 Description: Free, public domain image: Paratrooper Landing at Sunset During Training. A paratrooper with 1st Brigade Combat Team, 82d Airborne Division, has his feet and knees together to execute a parachute landing fall on the Siciliy Drop Zone, Fort Bragg, N.C., during a mass tactical airborne operation at sunset, July 23, 2009. (U.S. Army photo by Spc. Michael J. MacLeod.